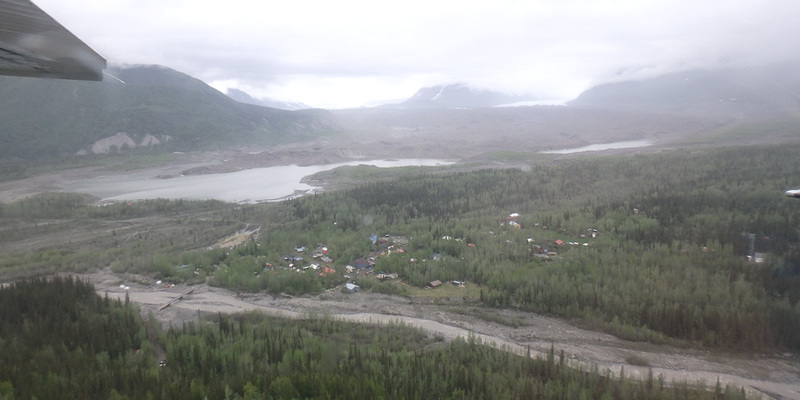 The remote mining town of Kennecott and its supporting outpost McCarthy have their roots in the early 1900’s, long before the Wrangell St. Elias National Park was established in 1980. In 1899 two prospectors bushwhacked their way into the Kennicott Glacier Valley and discovered what was then the richest copper deposit in the world. America was hungry for copper to produce electrical wire for its burgeoning industries of lighting and power. Before long, the boom town housed 550 employees who, along with simply surviving the relentless Alaskan winters, dug and blasted five separate mines, operated a state-of-the-art 14-story processing mill, and built a 196-mile supply and export railroad from scratch. Less than forty years after its discovery, the copper deposit was exhausted, and the area was abandoned in 1938. 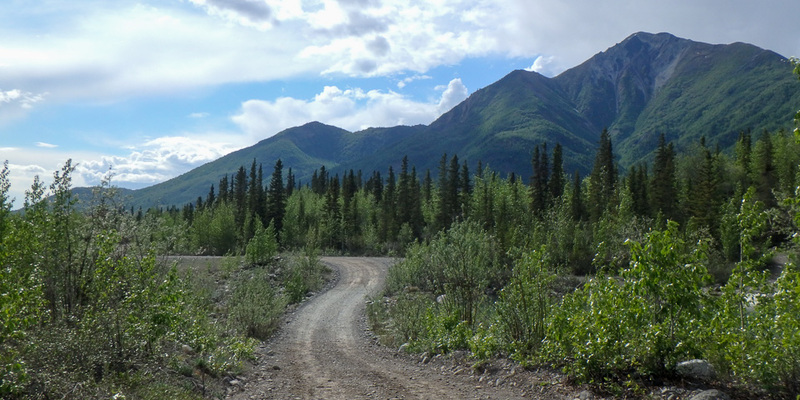 Forty-two years later Wrangell St. Elias National Park and Preserve (site / wiki) was established, completely encapsulating the ghost town of Kennecott and its 60 mile dirt access road. Kennecott, which is now federally protected as Kennecott Mines National Historic Landmark (site / wiki), is the most popular destination within Wrangell St. Elias NP and the Kennicott Glacier Lodge hosts visitors in the very same apartment buildings that the miners lived in, updated and refurbished, of course. The area is as vast and stunning as it is remote, and in addition to being the largest national park in the US, Wrangell St. Elias NP possesses more than half of America’s 16 tallest mountains. 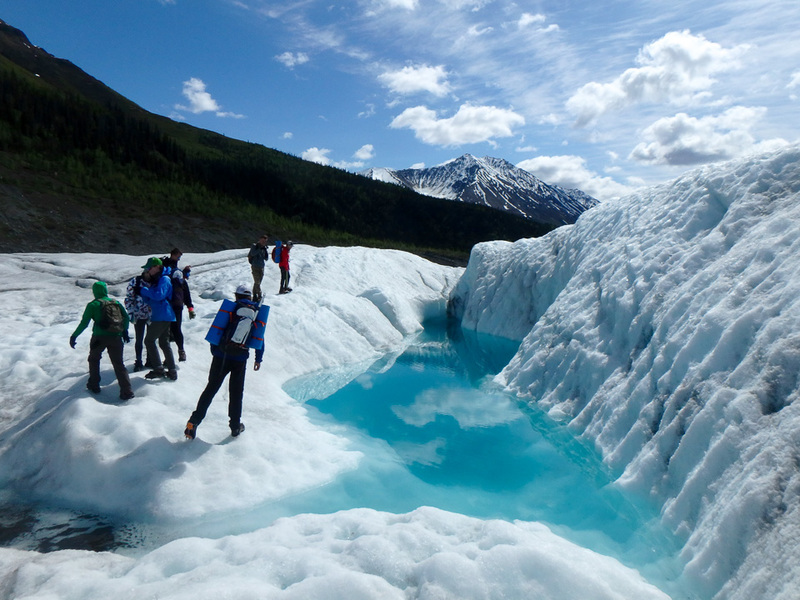 There are many adventure opportunities within hiking distance of McCarthy and Kennecott, including rafting, ice climbing, and glacial cave exploring, These attractions support various guiding and sightseeing companies. 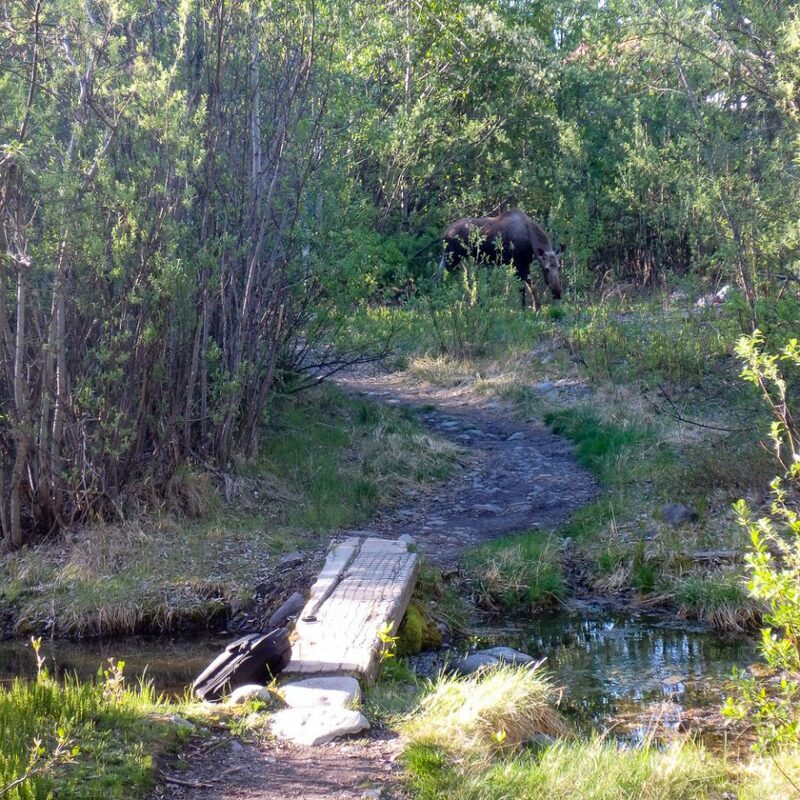 Moose encounter on my morning commute. I’ve learned to hike with my head up. The company I work for is Wrangell Mountain Air (site). 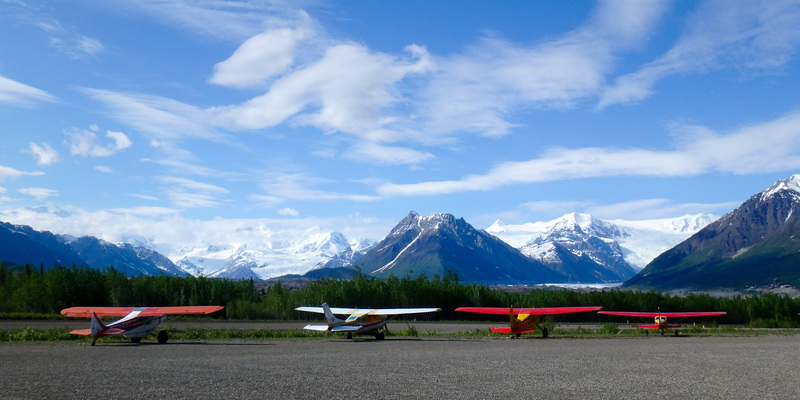 We do backcountry drop-off and extraction trips as well as scenic “flight-seeing” tours through the visually arresting Wrangell Mountains (wiki). In addition to coordinating the vast majority of tourism flights and mail delivery into McCarthy Airport, Wrangel Mountain Air owns the contract to the shuttle service between McCarthy (which is as far as drive-in visitors can drive) up to Kennecott (where the best views and historic buildings are located). I am a shuttle driver. The drive is approximately 10 miles round trip, and, including the time it takes to load and unload visitors, it takes around an hour to complete a circuit. I do about five shuttle runs a day, depending on how many visitors we have. 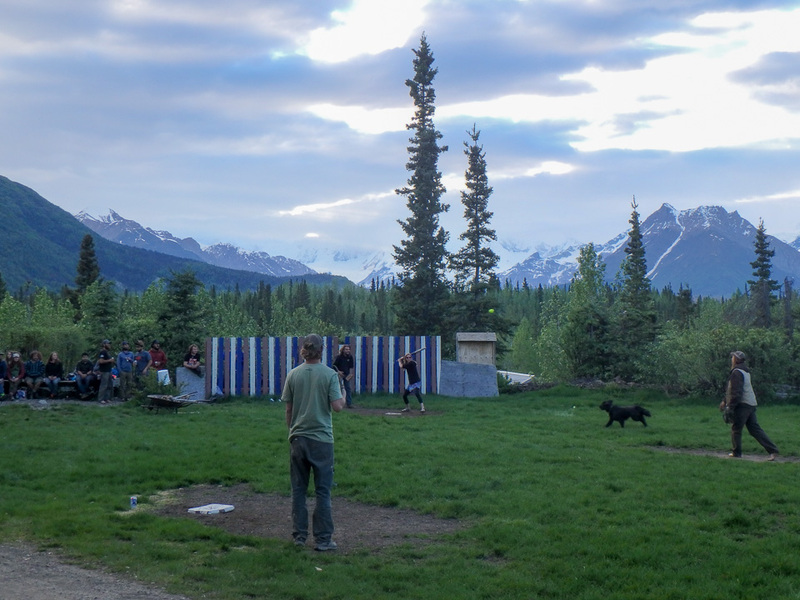 Pick-up softball games happen every Friday night. When I’m not driving, I clean vans by vacuuming the carpet, wiping down the interior with Simple Green, and pressure washing the outside. If the vans are already clean I service them by checking oil levels, checking tire pressure, and fixing flats. In addition to shuttle van work there are house chores to do. We check the water reserve for our crew house (Volume ≈ 300 gallons or 1,100 liters) and use our water truck (fire truck) to refill it as necessary. The kitchen and crew dining area may need cleaning. Trash gets sorted into recyclable, compostable, burnable (wood, paper, thin plastic, tin foil), non-burnable (thick plastic, metal, and toxic material like paint). This is a section of my shuttle route. Fireweed Mountain pictured. In our crew house we have two sinks, a stove, two fridges, a washing machine and a shower. We lack a microwave, toaster, and clothes dryer because of both space and electricity constraints. A roof top solar array supplies our batter bank, and the back-up generator will kick on if the batteries dip below a certain voltage or if we are loading down the system with power tools, etc. The only flushing toilet I’ve seen is in the only bar in town. 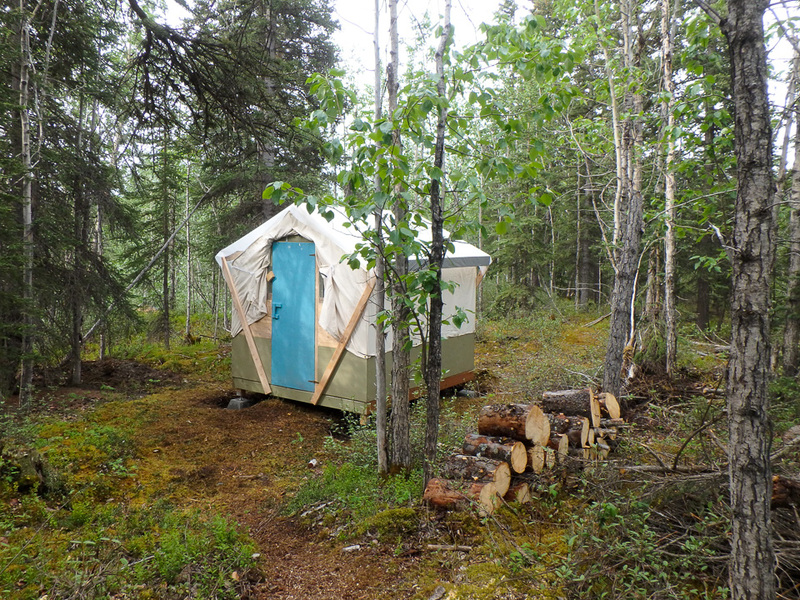 This is my wall tent. It has a wooden floor and frame with plywood walls up to my waist. Canvas is fitted over the frame and nailed into the plywood. Each corner of the floor is mounted to a concrete footing. The diagonal pieces of wood hold up a thick plastic awning to keep the rain off the canvas. I’ve been busy settling in so the last two weeks have been light on writing. Now that I have the hang of operations and I’m happy with how my tent is set up, I’ll have more time to throw at sharing my experience. This place and these people rock. Alaska seems to never quit amazing. at least your road doesn’t have any ditches. Yeah I saw pictures of the party. Looked awesome and I’m bummed I had to miss out. You’re right. The road isn’t too bad, and I get to meet some really interesting people on almost every loop. Great read. Definitely fine tuning the craft. Don’t feed the moose. Thanks Sport Mountain. I’m missing your BBQ Brodowns. Go ahead and watch 15 minutes of the cutlery corner for me, wouldya?